To strip mussels from a large variety of substrates with negligible damage to the product. Main dimensions: length 900mm, (35 7/16") width 900mm, (35 7/16"), height 600mm, (23 5/8). Two individual counter-rotating brushes can be electrically or hydraulically driven. At the back of the unit a rubber lined separately driven "capstan" serves for hauling the substrate between the counter-rotating brushes. Brush distance can be steplessly adjusted. 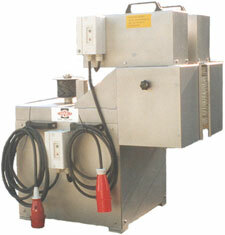 Optional hydraulic power pack type HPP-4. Either on the boat or on land. Can be used for a variety of substrates, with inter-changeable brushes. Negligible damage to mussels, easy to operate and install, electrically or hydraulically driven.